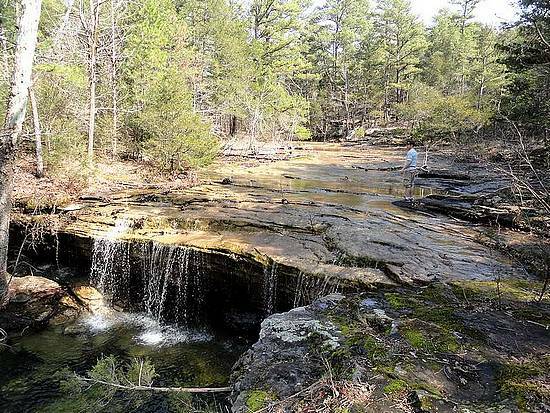 North Sylamore Creek is home to a very scenic hiking trail in the Ozark National Forest of north central Arkansas. The eastern end of the trail starts near Allison, on the White River. The first few miles wander through the forest and often parallels the base of some high bluffs and cliffs. There are also a handful of neat stream crossings along the way. My brother Jack and I decided to do a half-day of exploring, and elected to make an out and back hike from the Allison trailhead. We left the trailhead on a beautiful cool morning, and made our way across the field to the creek crossing. It was never over knee deep, but was at least fifty feet across. Some water shoes would have been nice, but we were undeterred. After the creek crossing, the trail climbed up the hill into the forest. Within a short distance, we arrived at the first set of cliffs. They were very cool, overhanging the trail with water trickling down in many places. There are several sections like this along the way, and many of the cliffs were quite tall. At about the two mile mark, we came to what I thought was the highlight of the hike. It was a creek coming down from one of the hollows, which washed its way over a slick-rock cliff into a pool just below the trail. It was very pretty. 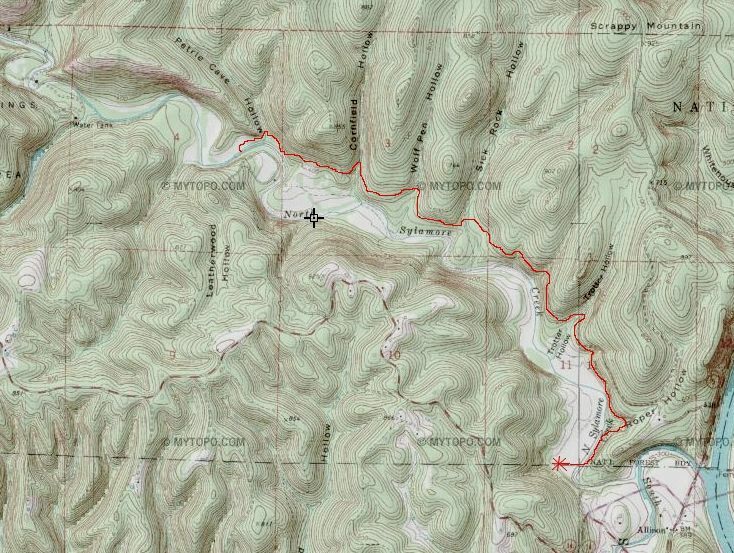 From there we continued on another 1.5 miles to a spot where the trail dropped down to meet North Sylamore Creek. We decided to make this our turnaround point, and then retraced our path back to Allison. The day was warming up, even in March, and we each enjoyed cooling off by dipping or heads under a trickle of water spilling over the cliffs. We covered seven miles round trip in just over three hours. The area is very scenic and highly recommended if you’re in the neighborhood. North Sylamore Creek, not far from the Allison trailhead. Crossing the creek at the beginning of the hike. The trail heading to more cliffs. Occasional views into the valley. Trail passing under some overhanging rock. One of many scenic stream crossings. A long slick-rock creek bed. Our turnaround point, about 3.5 miles west of Allison. Checking out the waterfall, two miles from the trailhead. Cooling off on the way back. One last shot of some cliffs.